Since this is just how things work out when booking time off, today was the first of two full days that we spent in Vilnius itself. It has to be noted that if you mainly wish to explore the old town (which is rather large for an old town) and the immediate surroundings there is no need for public transport. I was very close to buying a Vilnius Card to try and remove the hassle from public transport… but there really is no need to do so. Despite the classical surroundings of churches and beautifully stuccoed buildings it is hard to escape the feeling that Vilnius is a very young city. When you are in the fringes you will see a lot of murals, some of which take up the whole wall of a building. 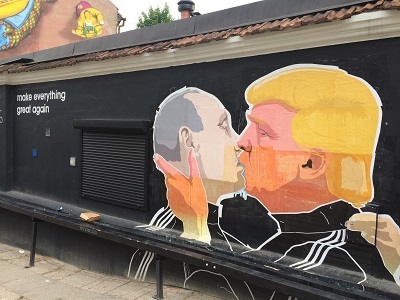 Of course when I saw this picture of Putin and Trump sharing a disgustingly wet kiss I knew that I would have to post this online. It is also difficult to deny that there is still an underlying cultural scuffle between the Vilnusians who have completely rejected anything Russian (minus religion) and those who are able to accept it, albeit in smaller doses. Then again, this is a city that recently celebrated 1000 years since being founded and has been invaded and occupied on numerous occasions. Russians, Poles, Napoleon, Germans and Swedes have all taken turns in making this city their own. It is therefore completely understandable that this country has a tremendous sense of national pride for their, still newly found, independence. Also, the volume of EU flags that you see being displayed the town centre is almost akin to what I saw in Luxembourg. Their inclusion in the European Union and NATO within early 2004 (after just over adecade of independence) must have been the ultimate act of of recognition for this small Baltic nation, something that looks like is still deeply felt. 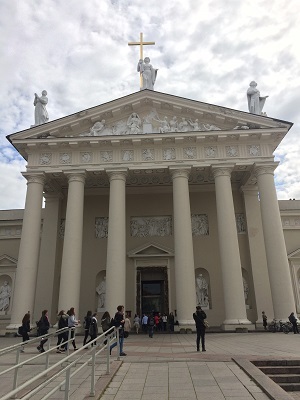 We started our day of exploration at Vilnius Cathedral – one of those places that has borne the brunt of Soviet ire. Stalin had this Catholic cathedral turned into a garage for army vehicles. The three statues on top were torn down and destroyed (replaced by replicas in 1996). It is mainly thanks to the number of paintings inside and the unique neoclassical building style that this building was turned into an art gallery before being fully reinstated as a cathedral. When we first arrived there was a mass on (it was Sunday after all) so we had to make a return visit later in the day. It really did feel like an art gallery inside of a church with wealth of paintings on the walls. 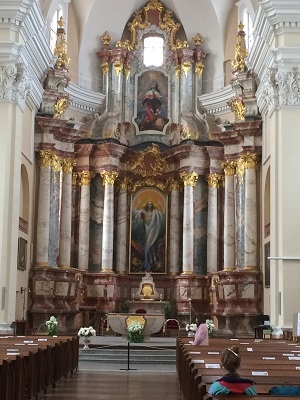 The real highlight was the baroque chapel of St Casimir. At the time it cost 0.5 millions gold pieces to produce! There are elaborate frescoes and marble work all over the chapel… to this Saint who devoted his (25 years of) life to charity work. In the cathedral square itself (which is huge) there is a slab known as a miracle stone. Here you turn 360 degrees and make a wish… but it won’t come true if you tell people the exact location (so hard cheese readers, I want my wish). 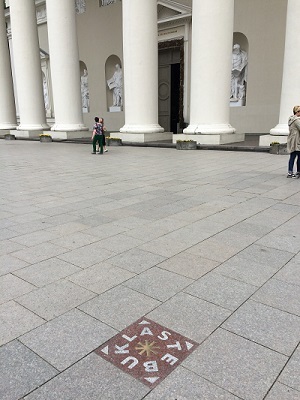 The stone marks the end of a chain of people 2 million long that stretched from Vilnius to Tallinn via Riga in the late 1980s as an act of Baltic solidarity. Yet another poignant reminder of the recent past. After the cathedral we moseyed on up to the Gendimo Tower. It stands on a hill looking overlooking all of the old town and is a great place to snag some pictures. 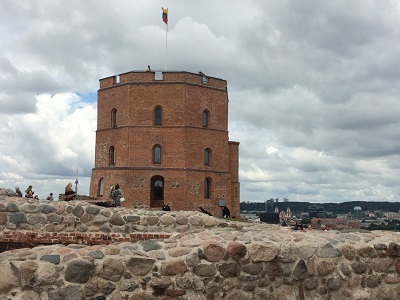 It is also one of those places that you can see from most locations in the Old Town, the Lithuanian flag proudly flying in the cold June breeze. The walk up isn’t too steep, but very cobbly. This is why we opted to pay the 1€ for the funicular railway down. Also, that was fun. It was lunchtime and instead of opting for something too heavy we sought out some coffee and cake. 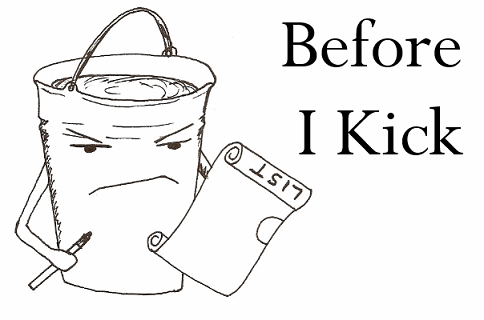 Unfortunately a lot of people had the same idea, so a lot of places were full. We managed to get a table in Soprano and, yes, I had ice cream for lunch. It was basically a deconstructed banana split and it was gorgeous. A brief rainstorm later and we did some more church hopping. The first was the gothic St Anne’s church. The outside is a feels compact and yet imposing with its deep red brickwork. The arrangement of the bricks really make this church stand out – to the point that when I first saw this from the tower I really wanted to find out what this structure was. The inside of St Anne’s was equally beautiful, just in a very different way. Ornate carvings depicting the stations of the cross and the incredibly detailed altar called to mind the Neumunster church in Luxembourg. 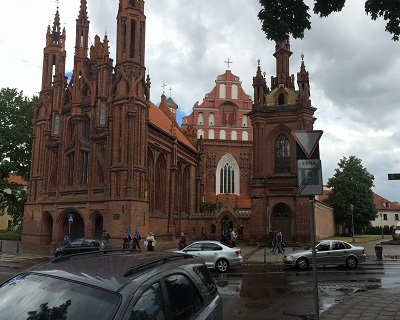 The final Catholic Church we visited on the day was St Casimir’s, a church dedicated to Lithuania’s patron saint (conveniently located opposite our hotel). It’s massive on the outside with a large crown donning one of the spires. 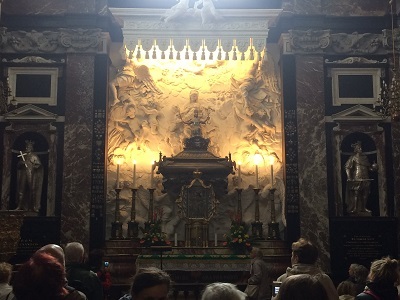 Inside it is a masterpiece of marble. I know I have been to visit enough churches that I should no longer be stunned, but the variety of marbles and the quantity of it that must have been used to construct the columns… well it boggles the mind. 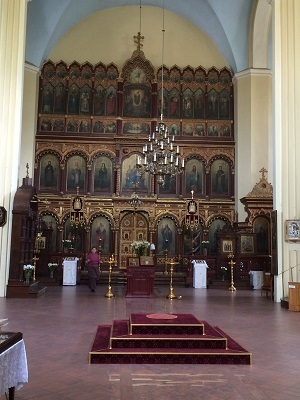 On our old town walk I was able to get my first glimpse at the inside of some Russian Orthodox churches. In all three of them I was presented with the same question: where do worshippers go during a service? As far as I could see there were no seats, meaning that it’s either a standing or a sit on the floor affair. With opera tickets for 7 o’clock we needed to get in an early dinner. I had already clocked the TripAdvisor recommended restaurant Forto Dvaras during our earlier walk so that’s where we headed. Now, seeing how Lithuanians tend not to be clock watchers when it comes to food, but eat when they are hungry (oh wise people of Lithuania) we were presented with a restaurant that had massive fluctuations between 5 and 6:30. It weren’t from packed to nearly empty to people having to be turned away. Once at the Forto Dvaras it was actually hard to pick what to have, so I went for another variation of the Zeppelin dumplings. 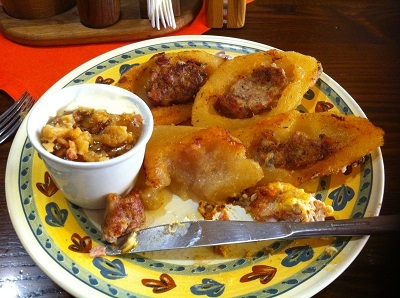 This time they were fried and presented with a sour cream and crackling sauce. I was in heaven. I had a try of the Gypsy Steak meal too, which was a pork steak baked in the oven with pickles and sauces. Have I found my culinary homeland? Only a family tree will prove otherwise! 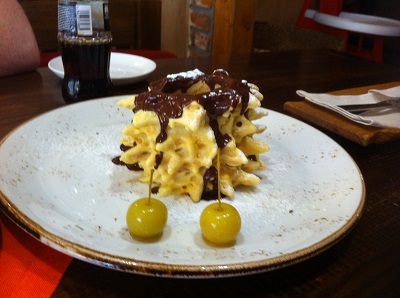 I came to Lithuania with one piece of food to find: and here it is in all its glory. The waitress was kind enough to let us know that one portion was big enough for two… and by gum she was right. It was a lot harder than I expected, having the consistency of a harder and less buttery shortbread. Having watched videos of how this was made (because in the week leading up to this trip to Lithuania I became mildly obsessed with the concept of tree cake) I was definitely not disappointed. Maybe one day I’ll learn how to make this. Oh and the whole meal came to less than 20€. What is this pricing here! It was opera time. So we made a flying visit to the famous statues of the three muses outside the national drama theatre before heading straight to the opera house. Manon is actually my second opera, but when I went to see La Traviata it was with school and in English. Therefore, I think it is fair to say that, 10 years later, this was my first real trip to the opera. For 18€ apiece we had seats in the fourth row of the stalls, slightly left from centre. As in, nearly perfect seats with a complete view. The staggering of the rows helps with this, but we also only had older women in front of us so there was nothing we couldn’t see. Whilst this opera was in the original French there were subtitles above the stage in both Lithuanian and English. Not Russian, not Polish, but English. Thank you again Vilnius for being so accommodating. As for the opera itself, well it was 4 hours that just flew by. We were prepared to duck out at an intermission and just head back to the hotel. Nope. Utterly transfixed. Everything in this production felt world class and like something that would have £100 of shown in the UK. The slightly modern stage production, which at one stage had Manon being lowered whilst clasping a bunch of balloons, worked brilliantly. Some of the more modern costume choices for the background women felt a little jarring at first, but in the world of opera you can get away with a lot before it feels out of place. Despite being a famous opera of its genre all of the music was new to me. It was a fantastic score though and brought to life by two stunning leads as Manon and Chevalier. The woman playing Manon was particularly fantastic having to go from manic pixie dream girl to desperation in a heartbeat. Where I liked Swan Lake I loved Manon. 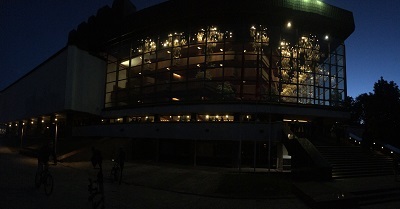 I honestly wonder if this trip to the Vilnius Opera House has started something.